p107 antibody detects endogenous levels of p107. A synthesized peptide derived from human p107. Small volumes of anti-p107 antibody vial(s) may occasionally become entrapped in the seal of the product vial during shipment and storage. If necessary, briefly centrifuge the vial on a tabletop centrifuge to dislodge any liquid in the container`s cap. Certain products may require to ship with dry ice and additional dry ice fee may apply. Function: Key regulator of entry into cell division. Directly involved in heterochromatin formation by maintaining overall chromatin structure and, in particular, that of constitutive heterochromatin by stabilizing histone methylation. Recruits and targets histone methyltransferases KMT5B and KMT5C, leading to epigenetic transcriptional repression. Controls histone H4 'Lys-20' trimethylation. Probably acts as a transcription repressor by recruiting chromatin-modifying enzymes to promoters. Potent inhibitor of E2F-mediated trans-activation. Forms a complex with adenovirus E1A and with SV40 large T antigen. May bind and modulate functionally certain cellular proteins with which T and E1A compete for pocket binding. May act as a tumor suppressor. Subunit Structure: Interacts with KMT5B, KMT5C and USP4 (By similarity). Component of the DREAM complex (also named LINC complex) at least composed of E2F4, E2F5, LIN9, LIN37, LIN52, LIN54, MYBL1, MYBL2, RBL1, RBL2, RBBP4, TFDP1 and TFDP2. The complex exists in quiescent cells where it represses cell cycle-dependent genes. It dissociates in S phase when LIN9, LIN37, LIN52 and LIN54 form a subcomplex that binds to MYBL2. Interacts with AATF. Interacts with KDM5A. Interacts with SV40 and JC virus large T antigens. Post-translational Modifications: Exists in both phosphorylated and unphosphorylated forms, and T, but not E1A, binds only to the unphosphorylated form. Cell-cycle arrest properties are inactivated by phosphorylation on Thr-332, Ser-640, Ser-964 and Ser-975 by CDK4. Similarity: Belongs to the retinoblastoma protein (RB) family. 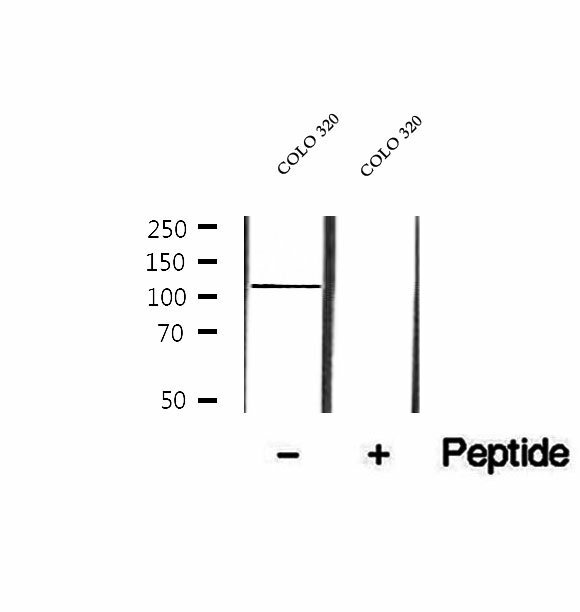 Western blot analysis of extracts of COLO 320 cells, using p107 antibody. 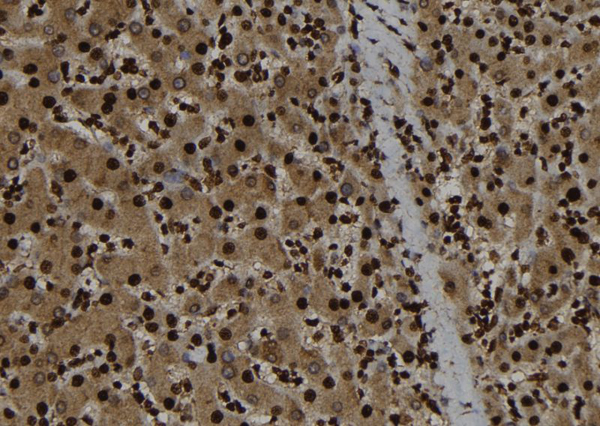 MBS9603666 at 1/100 staining Human liver tissue by IHC-P. The sample was formaldehyde fixed and a heat mediated antigen retrieval step in citrate buffer was performed. The sample was then blocked and incubated with the antibody for 1.5 hours at 22 degree C. An HRP conjugated goat anti-rabbit antibody was used as the secondary. NCBI/Uniprot data below describe general gene information for p107. It may not necessarily be applicable to this product. Key regulator of entry into cell division. Directly involved in heterochromatin formation by maintaining overall chromatin structure and, in particular, that of constitutive heterochromatin by stabilizing histone methylation. Recruits and targets histone methyltransferases KMT5B and KMT5C, leading to epigenetic transcriptional repression. Controls histone H4 'Lys-20' trimethylation. Probably acts as a transcription repressor by recruiting chromatin-modifying enzymes to promoters. Potent inhibitor of E2F-mediated trans-activation. Forms a complex with adenovirus E1A and with SV40 large T antigen. May bind and modulate functionally certain cellular proteins with which T and E1A compete for pocket binding. May act as a tumor suppressor. 1. Study found that the methylation of global DNA decreased gradually after irradiation, and the methylation of the promoter of RBL1 gene may play an important role in the induction of radioresistance for three dimensional cultured carcinoma cells.